This is a classic recording in every sense of the term. 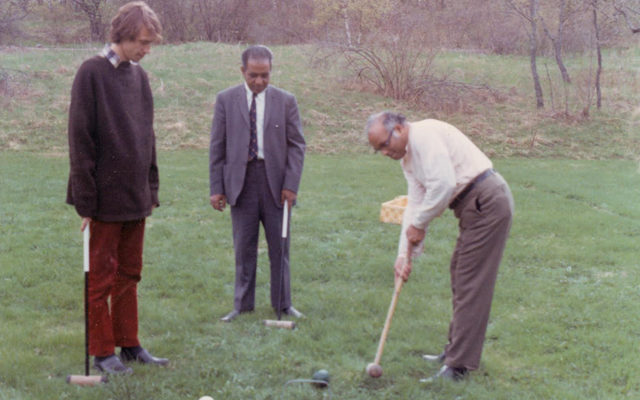 It is a rare performance of Pandit Taranath and Zia Mohiuddin in Sweden. It is the old version of a celebrated ‘night’ raga which means that the raga was originally played at night and that raga is Chandrakauns (or Chandrakosh) played in Hindustani mode. There are few more emotive performances of this delicately conceived work than what was performed on May 18, 1969 at the atelier of Sweden’s late painter Axel Törneman in Katarinavägen, Stockholm. Chandrakauns is redolent of emotions of loneliness, longing and delicate romance. It is impossible not to feast on the simple, idiosyncratic yet loveable masterpiece. The solemnity of the work is observed in the inimitable, excellent linear-note tone. Its showpiece nature is recalled with exceptionally clean articulation in flashes of virtuosity and elegance in the lyricism of its melody. As a celebrated raga , aligned with Raga Malkauns, this work is vividly characterised in its gloriously ascending and descending structures. 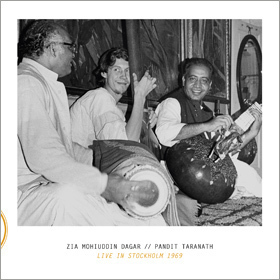 Zia Mohiuddin Dagar and Pandit Taranath run the gamut between profoundly beautiful crepuscular moods and pastoral tranquillity with absolute assurance. They don’t waste energy trying to find novel approaches but rather let the music speak, exercising restraint where other ustads (Indian maestros) take showy liberties. I have seldom heard night spirits, the whispering wind and the dome of darkness rendered with such persuasive grace. Ustad Mohiuddin Dagar and Pandit Taranath’s playing is full-blooded and when the music demands a natural atmospherics, Pandit Taranath and Ustad Mohiuddin Dagar are able to conjuror that with absolute mastery. This version of Chandrakauns is a ravishing display of forceful pyrotechnics and utterly masterful. While there is a wealth of dynamic contrast in this playing and no lack of sensibility, these characteristics are also drenched in vitality and sparkle. The players seem to reach the poetry of the work combining its memorable movements with a highly articulated performance that also highlights the solemn character of Chandrakauns with graceful dance movements. The two masters are joined by a very young Bengt Berger on tanpura performing the drone that glues the melody and percussion with a modicum of harmony. If you are a connoisseur of Indian music there would be a gaping hole in your library without this disc. Track List: Introduction; Chandrakauns – Aalap; Chandrakauns – Jor and Jhala; Chandrakauns – Gat in Chowtal. 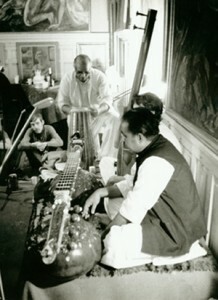 Personnel: Zia Mohiuddin Dagar: rudra veena; Pandit Taranath: pakhawaj; Bengt Berger: tanpura.